Migrant workers make for some of Qatar's most ardent sports fans. They spend their weekdays building stadiums, but they cannot actually play in them. Despite the challenges, these amateur athletes find a way to get their fix. The field is alive with sound: the sharp crack of ball hitting bat, the shouts and taunts of players, and the cheers of spectators. All of it underscored by the deep, drum-like beat of plastic bottles clapped against hands. The rubble-strewn remains of what was once a house are now teeming with color. Men in brightly colored shirts stake out pieces of the field. There are at least half a dozen games of cricket going on at once, a couple of narrow strips where men pass a football back and forth between them, and even a volleyball net set up behind a tall mountain of rubble. But the sun is going down. Already cars are winding their way between and past the few on-going matches and then out of the lot. Playtime is over for now. Friday will come again. The lot on Ahmed Bin Mohammed Bin Thani Street is nothing special. It is merely the not yet redeveloped land left behind after the house that once stood there was torn down. To many of Doha’s migrant workers, however, this plot is a sports fan’s dream come true. This is the case for men like Akhlaque Ahamad, who has been playing cricket in the lot every Friday for the two years he has been in Qatar. The 23 year old heard about the lot from friends who had come to Qatar before him from his home village in Nepal and has been coming regularly ever since. While he appreciates having space to play, Ahamad does note that the lot has its problems. The treacherous terrain, with its uneven ground, scattered debris, and the assortment of cars, motorcycles, and trucks making their way between the already too close together pitches, has not stopped the area’s migrant workers from swarming the lot every weekend. Many of them have been playing some kind of sport, be it cricket, football or volleyball, in their home countries since childhood and remain dedicated to playing. Most of them come to the lot in large groups of at least 10 people, and share equipment among themselves. Ahamad said he and his friends buy the equipment from supermarkets with their own money, and they now have a dozen balls and four or five shared bats between them. However, the source and quality of the equipment can vary from group to group. Some purchase professional-quality clothes and equipment from one of the three branches of the Olympic Sports chain conveniently situated nearby in Msheireb. Others, like Shakl Mahmud, 22, a cleaner with a facilities management and maintenance company, have equipment provided to them by their companies. Although Qatar has made efforts to cultivate a vibrant sports culture as the 2022 FIFA World Cup draws nearer, some of the country’s most dedicated sports fans face significant hurdles in pursuing their hobbies. One of the most prevalent problems for sports-inclined laborers in Qatar is the lack of proper turf or stadiums to play in. According to Mahmud, his company has a pitch in the Industrial Area where employees can play cricket, though he does not play often since he does not have the time. Unlike Mahmud with his sporadic playing schedule, Abdul Zaheer, 25, an accountant from India, spends every day after work playing sports in any one of many lots situated all over Doha. Even these lots are being threatened with closure as development advances in the Msheireb neighborhood. Last year, a small lot on Al Maymoun Street, another detritus-littered remnant of a demolished building that was popular among a local group of volleyball players, was closed off for a construction project. The men were asked to vacate the property, where a security guard had been posted. Tall fences now block it off from the surrounding streets. Qatar does not lack for professional stadiums, with more being built for the 2022 FIFA World Cup. As is the norm, most of these stadiums reserve their main grounds for the country’s professional leagues. However, around most of these stadiums there are practice pitches that the public can use, but usually only if they pay a high fee. There is one exception: West End Park. The West End Park cricket stadium is part of a large entertainment complex in the Industrial Area, which includes several cinemas, restaurants and supermarkets. The West End Park project was the result of a government effort to “focus on the Asian community,” according to Essam Abu Shahla, the sales manager of Ibin Ajayan Projects, the company that currently owns and manages the complex. There is a very large migrant community in Qatar. In fact, according to the World Population Review, as of 2014, less than 15 percent of Qatar’s population of 2.27 million is actually Qatari. Meanwhile, the “Asian community,” including Indian, Nepali, Filipino, Bangladeshi, and Sri Lankan nationals, makes up about 61 percent of the total population. Given that many of the laborers brought in to work on construction projects, including 2022 FIFA World Cup-related projects, are single men, the report also states that 76 percent of Qatar’s population is male. Many malls and parks in Qatar have instituted “family day” bans, denying workers entry on weekends so that families are not intimidated by their presence. Most of Qatar’s stadiums have had trouble with an abundance of empty seats. There have been recent headlines about workers in Qatar being hired to fill seats at matches due to low attendance rates by higher-income expats and Qataris. In fact, a survey conducted by the Ministry of Development Planning and Statistics found that 65 percent of Qatari respondents did not attend a single football (soccer) match in a stadium in the past season. Ironically, 69 percent of those surveyed (both expats and Qataris) cited the spread of paid fans (workers or others who were given money to attend a match) as one of the reasons they turn away from stadiums. According to Abu Shahla, the West End Park stadium has a capacity of 15,000 people and has no trouble drawing crowds whenever it is used to host matches for both international and local teams. Abu Shahla even recalled a recent game that drew in 13,000 spectators. 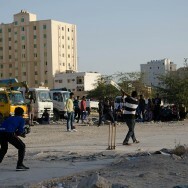 The stadium’s success in making use of its capacity could be attributed to the popularity of cricket among migrant workers in Qatar. “Cricket is my craze,” said Ahamad, who attended a Pakistan-Oman cricket game at West End Park a few months ago. “[The Asian community in Qatar]’s first game is cricket…The cricket here is a rush,” Abu Shahla explained. The complex was built to provide high-quality facilities for workers in Qatar, Abu Shahla said, which is why it is situated in the Industrial Area, which houses a significant portion of Qatar’s laborers. The stadium is the first international cricket stadium to be built in Qatar. Hosting games there typically costs between 40-50,000 Qatari Riyals, depending on the size of the event, according to Abu Shahla. Aside from hosting international games and leagues, the stadium is often rented out to local teams to practice as well. The crowds filling up West End Park on game days are proof of the migrant community’s great enthusiasm for sports. However, though the stadium may be conveniently located for workers in the Industrial Area, which is situated on the outskirts of Doha, this is not the case for those based more centrally in the city, such as in Msheireb. There, workers do not have a stadium of their own and instead many follow sports news and watch matches on their smartphones, since it is both time and cost effective. Some take a different approach: whenever a big cricket match is being televised, Msheireb’s migrants gather in front of store and hotel windows, peering in for a glimpse of a TV screen. The lack of affordable practice stadiums and pitches for workers in Msheireb is but one example of the limited government support available for sports-minded migrants. For instance, the Supreme Committee for Delivery and Legacy features three projects on its website as part of its outreach efforts to include workers in Qatar’s growing sports scene. The first outreach effort the website lists is the fact that the committee sponsored three soccer matches for workers in three cities on Qatar National Day in 2013, contributing money for participation prizes and spectator giveaways. The second project was somewhat grander in scale. According to the committee’s website, it also sponsored the Barwa Real Estate Company’s building of football pitches with FIFA-certified artificial grass in a workers’ sports complex in Al Khor, a coastal city north of Doha. The recreational complex opened last year, the result of collaboration between Barwa, the committee, the Ministry of Municipality and Urban Planning, and Qatar Foundation. The facility includes a number of cricket pitches, basketball courts, and volleyball courts, and is open to workers for “a nominal fee,” meant to cover the not-for-profit project’s operational costs, according to a press release on Qatar Foundation’s website. Finally, as part of its outreach efforts, the committee also lists its sponsorship of a Workers’ Cup, an annual competition organized and held by a private sports events company, Quantum Sports, also known as QSports. It might not be easy for Qatar’s migrant population to engage in sports, but there is a growing movement among some private companies to ensure that their employees can join in. QSports, which was founded in 2011, started the Workers’ Cup initiative two years ago. Only blue-collar workers — no executives or managers — are allowed to participate. “We saw the hype about how Qatar is mistreating workers — treating them like slaves — and we wanted to do something for them and change the image,” said Mohamad Zaabalawi, the chief executive officer of QSports. The first Workers’ Cup was held in 2013, and it featured a variety of sports, including cricket, volleyball, and basketball, Zaabalawi said. However, since the event’s sponsors (Qatar Stars League, and the Supreme Committee for Delivery and Legacy) are football-oriented, they were required to narrow it down the next year to just a soccer tournament, according to Zaabalawi. “[Tournaments] are costly. And you can’t make the workers pay, so it’s not feasible without sponsors like the Qatar Stars League,” he said, explaining that the company cannot offset the costs of mounting the Cup without the aid of its sponsors. But he still hopes to be able to add a variety of sports to the Cup, Zaabalawi added. Zaabalawi explained that securing sponsorships for the Workers’ Cup initiative was not difficult. Due to the bad press Qatar has received for its treatment of workers in various foreign media outlets, government organizations were eager to lend their names to the tournament. “They need us more than we need them,” he said. There is also some interest among private companies in affording workers the opportunity to play sports. According to Zaabalawi, QSports works with various companies to organize corporate sports leagues, as well as organizes National Sport Day events for them. Qsports also holds various tournaments throughout the year that do require an entry fee and offers prize money to the winning team. Qsports does not yet have a dedicated sports training ground of its own, though Zaabalawi said that is their next project. For now, they work with training academies to rent out grounds for workers to practice and train before tournaments. “They [the workers] actually take it very seriously - they go and train [before a tournament],” Zaabalawi said. Many of the workers have very limited free time, Zaabalawi said, since they work six and sometimes seven days a week. As a result, he observed, they are excited to go out to the stadium and play. “You will never see them happier,” he said.